Normal rules don’t apply to Stephen Hawking, perhaps the most popular cosmologist of the past century. His severe case of amyotrophic lateral sclerosis, or Lou Gehrig’s disease, has trapped his bold mind in an uncooperative body, a circumstance that’s an inseparable part of his fame. Now 71, he’s the rare scientific luminary who’s also a celebrity, thanks to his best-selling book, “A Brief History of Time,” and appearances on comedies like “The Simpsons. So a normal analysis of the bio-documentary “Hawking” matters little. The movie has the typical mix of interviews and archival pictures, serving mostly linear storytelling. The winning approach here is to let the movie be told in Mr. Hawking’s voice, at least his computer-generated one. “Welcome to my world,” he says. In one sequence, software engineers huddle with Mr. Hawking to give him a faster means of communicating (based on facial tics, mostly), but you’d swear he finds a way to put tone in this narration. He tells us about his childhood and his Oxford student days, when his illness was diagnosed; about his first marriage; about his students; about his science. We see him in daily tasks like eating, assisted by caretakers patiently lifting food to his misshapen, passive face. But it’s not his vulnerability that lingers here; it’s his ambition and drive. 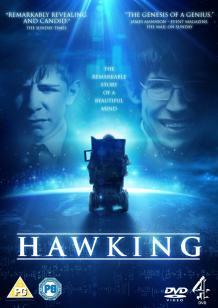 Mr. Hawking — no shy and retiring genius, he — has star quality that he lets shine, whatever the limitations of its packaging. Raymond Laflamme earned his PhD at the University of Cambridge in the Department of Applied Mathematics and Theoretical Physics (DAMTP) under the direction of Stephen Hawking. Laflamme and Don Page are responsible for having changed Hawking's mind on the direction of time in a contracting Universe (as described in Hawking’s best-seller "A Brief History of Time").